What are they and how do I work with them? Navigation menus have multiple purposes. Beyond allowing customers to get around your shop they also show new visitors what your shop actually sells quickly and easily. It allows visitors to establish if they are in the right place (or right site) and if they should continue to take a look around. If they don't initially see what they're searching for then they may leave (bounce) to find it elsewhere. As part of the platform, PushCommerce allows you to have three types of navigation menus. 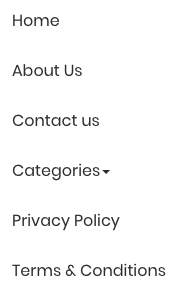 These are Main (Header), Footer (bottom of the page) and Side Menus (in Product Pages). The important one for our purposes is the Header menu. In 2011 the Nielsen Norman Group undertook some research and found that the first 10 seconds of a page visit are the most crucial to keeping the visitor 'on site'. As time passes the visitor is more and more likely to remain on your page/shop/site. Therefore, we need to communicate our value proposition to the visitor quickly and efficiently within those 10 seconds. Now of course there are a bunch of ways we can do this from our logo to images, shop names, banners and text. These all take some practice and perhaps some A/B testing to get just right. A quick win is, you guessed it, navigation menus. So, you need to show what you 'do' quickly. One way you could accomplish this is by adding product categories to the menus, quite literally giving a breakdown of what you're selling - a great example of this is shown below from English Accent. Alternatively, well-known brand names of items you stock can work really well. Seeing a familiar name on a new website gives a sense of security to the visitor and authenticity to your business. This is great if you have a range of products for each brand as a reseller. For the vast majority of businesses the navigation menu should include an 'About us' and a 'Contact us' option. An 'About us' section is your chance to tell your visitor about yourself and why they should trust you to look after their purchase. The 'Contact us' allows visitors to find out more about your business on their own (saving you time) and enabling easier contact. How Do I Change Navigation Menus on PushCommerce? 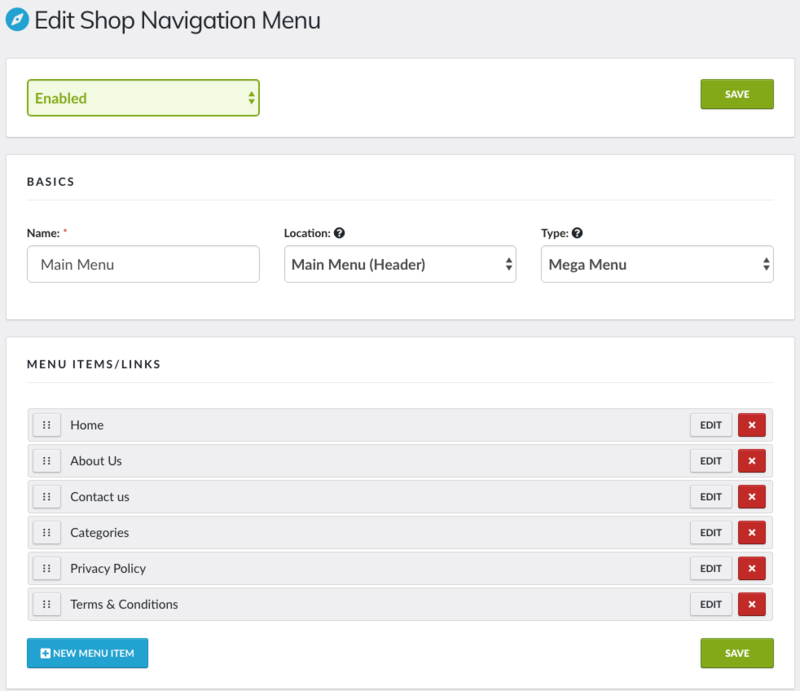 You can adjust and amend your navigation menus in your shop's admin area. Once you've logged in you can find the 'Shop' logo on the left hand menu and, once expanded, you will see the 'Navigation Menu' option as show below. Once you are on the Navigation panel you will see a button to 'New Menu'. 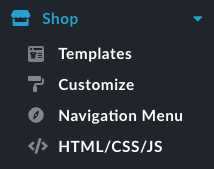 You will also be able to see your current navigation menus that are Enabled and Disabled across your shop front. You can edit these by clicking the 'Edit' button or delete them by hitting the red 'X'. If you would like to add a new menu simply hit the blue New Menu button to progress to the next screen. We'll need to give the menu a name, one which will tell you where and what the menu is. PushCommerce allows you to add 3 menu types: Header, Product and Footer (bottom of the page). Next we need to tell the platform where we would like the menu to go. For example if our navigation menu is called 'Main Menu', we can then add menu items such as 'Categories' with sub-categories of Jeans, Trousers, Shoes, Accessories, etc. As well as About Us, Contact Us, Home and relevant Policies. You can see that the Categories Menu has an option to expand it. This can be done within the Menu Item/Links Panel. 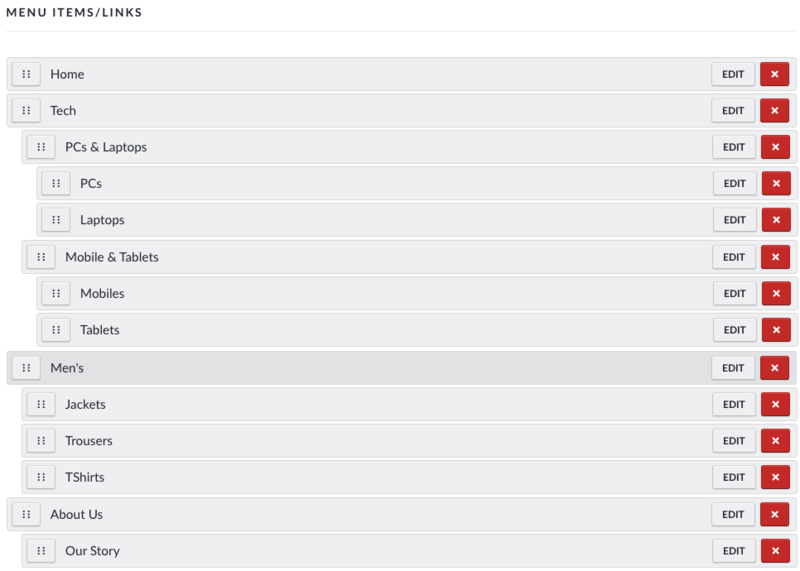 Then check the "All Categories" box as shown below. Alternatively, you can select from one of the categories via the Search box, read more about Multi-level menus below. The menu below may look a bit extreme but it shows that we can have 3 full layers of menu's. In order to align these menu items correctly, you simply need to add a new menu item (as shown above) and once added drag and drop the menu under the relevant parent e.g. add 'Mobiles' and then drag and drop under and to the right of 'Mobile & Tablets'. On the front-end (Customer facing) side of our shop the menu 'Laptops' under appear as Tech> PCs & Laptops> Laptops. Of course, a customer could simply click on the 2nd level and be able to see the mix of PCs & Laptops. Note: how the menu looks will depend upon your template and the header block that you have picked. As always, if you have any queries then don’t hesitate to contact the team on our Live Chat or email.